Our latest product is the result of teacher feedback and we are ever so grateful. I managed to get these printed in time for ULearn and they sold like hot cakes! Thank you so much to the wonderful teacher from Knighton Normal school who suggested we add ‘predicting’ into the early strategy mix. We now have this fabulous set of cards, A4 size, laminated for sale on our website. 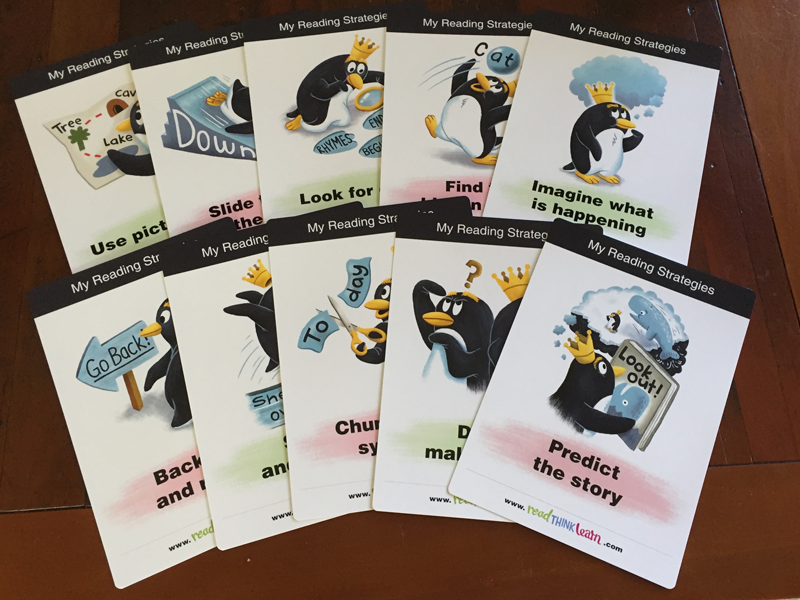 They complement our junior reading strategy bookmarks which schools are now buying up ready to add to the stationery lists for next year’s 5 year olds. Meeting teachers, sharing ideas, learning different systems and strategies, viewing different resources – are all the parts of this journey that I love the most. This last month has been one exploring different parts of New Zealand and attending both the NZ Literacy and ULearn conferences. A comment often made was an acknowledgement of how reasonably priced our resources were. We are proud of the fact that we are ‘affordable’, are created by teachers, for teachers, and of how we are addressing so many of the hurdles we have as teachers: finding the quality, meeting the needs, scaffolding and (above all else) having the TIME to create resources. One of the things I shared both at the conferences and while visiting schools was the existence of the site Unite for Literacy which has a fabulous array of online readers. It is free and we have many of their readers covered with some suggested activities that you can download and use as part of our annual subscription. Here are a few freebies. I trust that this last term of the New Zealand school year is full and fruitful. For those of you in the Northern hemisphere who are just beginning your new school year – I have some great tips coming up in my next blog that I found helpful to focus on as I began each school year. Do keep in touch and we, as a team, will do everything in our power to support the fabulous work you are all doing! All the best for a wonderful future full of learning.